Once free of the computer's influence, Lord is portrayed as an amoral businessman, but not a real villain. During the time that Giffen and DeMatteis were writing the Justice League, Lord is shown struggling with his conscience and developing heroic qualities, though he would remain a con-artist. Later, Lord is diagnosed with a brain tumor and seemingly dies. Kilg%re, however, had been waiting patiently for the right moment to reactivate its control of Lord. Kilg%re downloads his consciousness into a duplicate of one of the Extremist robots, Lord Havok (in a further retcon the body is said to be a New Genesis-built automaton, which later fell into Checkmate's possession). In this form, he spends some time testing the League for unknown reasons. He also takes control of the secret organization known as the Arcana. His cyborg body later comes to resemble his original human form. During this time, Alexander Luthor, Jr., the god-like son of Lex Luthor from an alternate Earth, gives Lord control over Batman's Brother Eye, a satellite system Batman created to monitor all superhuman contact. Lord uses Brother Eye to create an army of OMACs (humans infected with a nano-virus that transformed them into cyborgs), programmed to hunt down and kill all superhumans. During the Blackest Night (2009–10) storyline, Maxwell Lord is identified as one of the deceased people entombed below the Hall of Justice. Lord's corpse is revived as a Black Lantern during the event. Targeting Wonder Woman, he lures her to Arlington National Cemetery with a trail of slaughtered bodies. When Wonder Woman arrives, he springs a trap, using black rings to revive the bodies of fallen soldiers. Wonder Woman uses her lasso to reduce Lord and the soldiers to dust. However, as she leaves, the dust begins to regenerate. 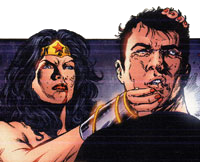 Some time later, Lord resumes his attack on Wonder Woman, who had recently been deputized as a Star Sapphire. Wonder Woman encases Lord's body in a violet crystal, then shatters it to pieces. However, Lord continues to taunt her, speaking out of a piece of crystal. He is later brought back to life by the power of the White Light. Though Guy Gardner attempts to restrain him, Lord uses his mind control abilities to make Guy let him leave. When Captain Atom and Magog battle in the heart of Chicago, Captain Atom is able to convince Magog that he's being used, and Magog remembers Lord. Lord, watching, uses his powers to force Magog to kill himself. He then makes everyone believe that they watched Captain Atom murder Magog. The Entity proclaims that Lord has completed his task, and his life is restored to him. After briefly receiving a White Ring, the recently returned Bruce Wayne seems to be aware of Max Lord's resurrection. When Captain Atom absorbs the energy from Magog's spear, he is propelled forward through time to 112 years in the future, where Lord, while long dead, has plunged humanity into a massive metahuman war ruled by OMACs. Captain Atom is eventually returned to the present, but not before a dying Power Girl tells him that the catalyst for all this was Wonder Woman's death by Lord's hand. Also, Batman (Damian Wayne) tells him how to stop Lord's ultimate plans. However, Lord is struck with the discovery that, with the exception of the original four ex-JLI members, no one in the world remembers Wonder Woman. Later, when the Creature Commandos attack the JLI embassy, Lord poses as a member. He captures Jaime Reyes, and heads towards the teleporter with him, while the others are unable to stop him. Lord regains his abilities to transform his targets into cadaver OMACs, and he tortures the captive Blue Beetle. Lord's mindwipes feed off psychic energy, so the more people who are around, the faster some of them will forget. In issue 19, the rest of the team locates Lord's secret facility in a submersible below the Sea of Japan. Seconds before the team reaches him, and as predicted by the White Ring, Lord shoots Jaime in the head (echoing his execution of Jaime's predecessor, Ted Kord). The JLI arrives and attacks Lord, but he escapes from the JLI in one of his headquarters' escape pods, and the headquarters vanishes. While the JLI learns Jaime is alive, the team also learns that Lord not only manipulated them, but also wanted the JLI to chase him to distract Checkmate. Later, Lord uses a device to enhance his mental powers, turning people around the world into OMACs to attack Wonder Woman and the JLI. Before the device activates, Lord sends the OMAC Prime that he controls to attack the heroes. Booster Gold manages to locate Lord's flying headquarters, attacking it to confront him face-to-face. Lord gains the upper hand with his mental powers, but Captain Atom grabs him, after having become overloaded with quantum energy in the fight with OMAC Prime and about to be pulled into the timestream. Atom threatens to take Lord with him unless Lord undoes the global mindwipe, and a desperate Lord complies. Captain Atom is pulled away and Lord teleports to escape from the heroes. Later, he posts an online video where he blames Professor Ivo for Magog's rampage. He also says that he only wants to protect the world from the metahuman threat, and he will continue to do so in secret. In September 2011, The New 52 rebooted DC's continuity. In this new timeline, Max Lord still runs Checkmate as the Black King, but now has leadership seniority over Cadmus and its programs. He successfully captures Batman's superpower monitoring satellite, Brother Eye, for his own purposes, but it ends up creating an agent with which it would act through seeking vengeance. Lord ends up getting into heated battle with an all new OMAC who was formerly one of the project's employees. Booster Gold (Michael Jon Carter) is a fictional superhero appearing in American comic books published by DC Comics. Created by Dan Jurgens, the character first appeared in Booster Gold #1 (February 1986) and has been a member of the Justice League. He is initially depicted as a glory-seeking showboat from the future, using knowledge of historical events and futuristic technology to stage high-publicity heroics. Booster develops over the course of his publication history and through personal tragedies to become a true hero weighed down by the reputation he created for himself. Brightest Day is a 2010 - 2011 crossover storyline published by DC Comics, consisting of a year-long comic book maxi-series that began in April 2010, and a number of tie-in books. The story follows the ending of the series Blackest Night and how the aftermath of these events affects the entire DC Universe. Catherine Maureen Cobert is a fictional character published by DC Comics. She first appeared in Justice League International vol. 1 #8 (December, 1987), and was created by Keith Giffen, J. M. DeMatteis and Kevin Maguire. Checkmate, a division of Task Force X, is a fictional covert operations agency appearing in American comic books published by DC Comics. The team first appeared in Action Comics #598 and proceeded to have its own ongoing title in Checkmate!. In the wake of events depicted in the mini-series The OMAC Project and Infinite Crisis, Checkmate had been re-chartered as a United Nations Security Council-affiliated agency and had its own series, Checkmate (vol. 2). The Extremists are a team of supervillains in DC Comics Justice League titles; they were introduced in Justice League Europe issue #15. Fire (Beatriz da Costa) is a fictional comic book superheroine from the DC Comics universe. Gil Bellows (born June 28, 1967) is a Canadian film and television actor, screenwriter and director. He is best known for the roles of Tommy Williams in The Shawshank Redemption, Billy Thomas in the television series Ally McBeal, and as CIA agent Matt Callan in the television series The Agency. In 2016-2017, he was a regular cast member in the USA Network series Eyewitness. Sir John Maxwell of Nether Pollok (1648–1732), also known by his judicial title Lord Pollok was a Scottish politician and lawyer. He was the son of Sir George Maxwell of Auldhouse and Pollok and Annabella Stewart. He trained as a lawyer and became a Privy Counsellor. He was made a baronet in 1682, of Pollok in the County of Renfrew (now Pollokshaws in Glasgow) and was Rector of the University of Glasgow from 1691 to 1718.He was a Treasury Lord Commissioner in 1696 and 1698 and a Shire Commissioner for Renfrewshire in the Parliament of Scotland for 1689–93, 1695–96 and 1698–99.He served as Lord Justice Clerk from 1699 to 1702 and succeeded Lord Newbyth as a Senator of the College of Justice from 1699 to his death.He died at Nether Pollok in 1732. He had married Marian Stewart, daughter of Sir James Stewart of Coltness and Kirkfield. They had no children and he was succeeded in the baronetcy by his nephew John Maxwell of Blawerthill. Justice League International (JLI) is a DC Comics superhero team written by Keith Giffen and J. M. DeMatteis, with art by Kevin Maguire, created in 1987. Justice Riders is a 1997 Elseworlds prestige format one-shot, from DC Comics, written by Chuck Dixon, with art by J.H. Williams III. The story involves the Justice League of America recast in assorted roles in the Wild West. Wonder Woman is a Marshal, Booster Gold is a Maverick-style gambler, and Wally West is an outlaw, wrongly accused of the death of Barry Allen. Ted Kord is an inventor wearing a pair of antennae. Guy Gardner is a Pinkerton detective hunting Flash. Hawkman and Martian Manhunter also appear. There is also a cameo at the end by Clark Kent, as a dime novel writer. Maxwell Lord is the villain, prefiguring his eventual unmasking as a criminal mastermind out to destroy meta-humans in actual DC continuity years later. The OMACs (; Omni Mind And Community, originally Observational Metahuman Activity Construct) are a fictional type of cyborg appearing in comic books published by DC Comics. They are based on the Jack Kirby character of the same name. Oberon is the diminutive manager of Mister Miracle, the world's greatest escape artist. He is named after the legendary king of the faeries (see below). Oberon was created by Jack Kirby. Peter Facinelli (born November 26, 1973) is an American actor and producer. He starred as Donovan "Van" Ray on the Fox series Fastlane from 2002 to 2003. He played Dr. Carlisle Cullen in the film adaptations of the Twilight novel series, and is also known for his role as Mike Dexter in the 1998 film Can't Hardly Wait. Facinelli was a regular on the Showtime comedy-drama series Nurse Jackie, portraying the role of Dr. Fitch "Coop" Cooper. He portrayed Maxwell Lord on the first season of the TV series Supergirl. Super Buddies are a team of comic book superheroes in the DC Comics universe who appeared in the six-issue Formerly Known as the Justice League miniseries in 2003, and its 2005 sequel, I Can't Believe It's Not the Justice League (published in JLA Classified). The team was put together by former Justice League bank roller Maxwell Lord as a superhero team "accessible to the common man". The team is considered more or less inept and incapable of being of any help by many (including the actual Justice League). The team was created by writers Keith Giffen and J. M. DeMatteis, and artists Kevin Maguire and Joe Rubinstein. Giffen, DeMatteis, and Maguire had previously created the tongue-in-cheek Justice League International comic book in the 1990s, and revived a similar style of comedy as that series featured. The OMAC Project is a six-issue American comic book limited series written by Greg Rucka with art by Jesus Saiz and published by DC Comics in 2005. The Wonder Twins (Zan and Jayna) are a fictional extraterrestrial twin brother and sister superhero duo who first appeared in Hanna-Barbera's American animated television series The All-New Super Friends Hour. They subsequently appeared in comics based on the animated series, and were later introduced into the main DC Comics Universe. They have since appeared in other media, including animated series such as Justice League Unlimited and Teen Titans Go!, and the live-action TV series Smallville.